What if you had intuition? And, what if intuition could improve your health and well-being? How might your life be different if that were true? Like many people, I used to think that intuition was reserved for “the gifted”, and produced insight into the future or situations in a mystical way. Does that resonate with your belief, too? Though I had a gut feeling that was “true” at times, I always considered it to be a fluke, or a fleeting moment that may or may never happen again. I never used to think of myself as intuitive. Sound familiar? And, I certainly never thought of it as a capacity I could develop, that could enhance my health and well-being. But, then I learned I was…. uh….. wrong. Yep. W-R-O-N-G.
We ALL have the capacity for intuition. That includes you and me. Yes, ALL of us. The capacity for intuition develops to a greater extent in some people than others, but we all have it. When we perceive facts directly, independently from any reasoning, and outside the function of our other 5 senses, we are using intuition. Still sounds like a stretch, though, right? Intuition is part of the mind-body network that you can learn to tap into, and develop. 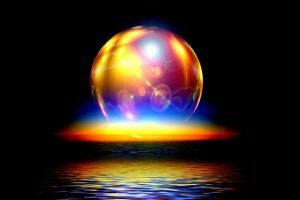 It is no different than your other senses and functions as a transmitter of mind-body messages that you can use to guide your choices and actions for a happier, healthier life. 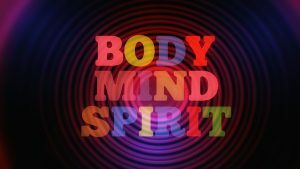 I have shared information with you in previous posts regarding the mind-body relationship, and how you can use that to your benefit. 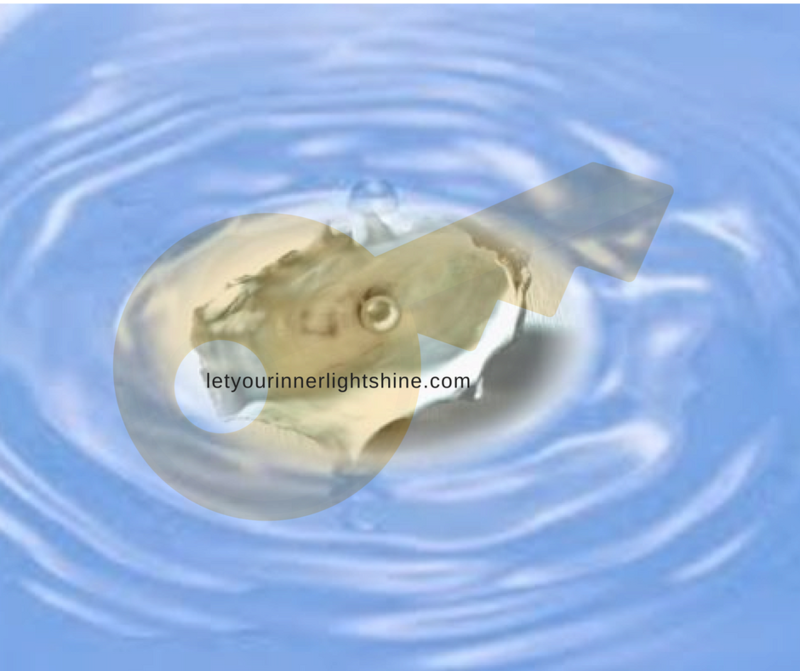 That relationship IS part of your innate intuition network, which I call your Inner Wisdom. Your experiences, and the emotions relating to them, get encoded in not only your brain, but your tissues and organs as well. Your memory of those experiences is thus, not only “brain memory”, but “tissue memory”. Because of that “memory”, those experiences can continue to influence your life, health, and reality. Not only do they influence your conscious mind, they communicate messages to you through “symptoms” of physical disorders and disease. The trick is in learning to LISTEN and respond differently, in order to create a new outcome, i.e. a new reality, for yourself. NOTE: Please remember none of this is intended to substitute for necessary medical care. So, how do you connect with your intuition? You have to increase self-awareness, and learn to screen out the “interference”. It comes with practice. Practices that support reaching a deep, quiet, relaxed state naturally support developing your capacity for intuition. These practices help you discern what really “matters”, and what is non-serving, distracting “chatter”. When my messages, a.k.a. “symptoms”, grew loud enough that I couldn’t ignore them, I sought out craniosacral therapy. At the time, I had NO clue that there was anything for me to “hear”. open to what I REALLY needed to know. My system released all of the distracting, non-serving noise making that deeper, clearer listening easier. As I began to listen, I learned to respond in a way that improved my health when nothing else did. My life grew richer when I didn’t know I even wanted that. I had a greater connection to my life, and to the choices that were best for me. I experienced a deeper “knowing” that transcended reason and aligned with a Higher plan. And, through that knowing, I instinctively aligned with, and cultivated, the changes in my life that were an inherent part of this rewarding outcome. What support is there for this concept? One HUGE key in my process was the work of medical intuitive, neuropsychiatrist, and neuroscientist Dr. Mona Lisa Schulz, M.D., PhD. Her book Awakening Intuition: Using Your Mind-Body Network for Insight and Healing (read an excerpt), helped me understand what was happening with me in ways nothing else had. It confirmed what my intuition was telling me, supporting me in taking my process to the next level. And, it fascinated the daylights out of me, too….. The work of Carolyn Myss, Christine Page, Barbara Brennan, Anodea Judith, and many others also provided the support and confirmation I needed to understand, embrace, and follow my intuition. My experience and training during my craniosacral therapy and transformational coaching certification processes deepened my capacity for intuition, too. This work developed my faith, trust, and relationship with that which is Higher than our Ego selves, which helped me increase my capacity to support not only my own, but the inherent healing journey of others. How does Transformational Coaching help? Transformational Coaching transcends the traditional goals and accountability coaching model. It helps you connect to what is in your heart, and to your own YOU-nique journey to being who you are truly designed to be. Transformational coaching helps you discover what is and is not working for you, filter out the “noise” and “distractions” to hear your TRUTH, so that you can make the best decisions, and take the best actions for YOU. It adds the benefits of working in a systematic, yet organic way, that keeps you on track and accountable. Bottom line, what does Intuition do for health and well-being? 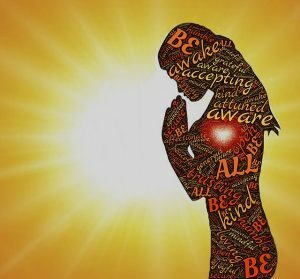 Developing your capacity for intuition can reduce stress, and help you discern your best choices for YOU by listening to your Inner Wisdom, i.e. utilizing your mind-body network. That network IS a part of your design as a human being. Your body responds to input received and processed in your nervous system. That includes input from all of your senses, including your gut, your intuition. And, processing that input, listening to it, can guide you to new awareness, perspectives, beliefs, and choices for more energy, joy, and peace. All of my work with clients helps them learn to discover the pearls of wisdom, and listen to the messages, in their symptoms, pain and stress to create the energy, joy, and peace they seek. Here’s to Higher Knowing and “Gut Feelings”! 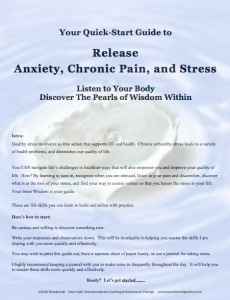 If you would like help learning to listen to your body, and developing your capacity for intuition, grab your FR*E copy of my 2-page Quick Start Guide: 7 Steps to Release Anxiety, Chronic Pain, Tension, and Stress to get you started. You will receive that gift, as well as on-going resources and support to keep you on track. So, ARE you listening? What does your gut tell you now?